Fall is such a lovely time of the year. All the colors, the textures and the spectacular golden hour. It’s all just so beautiful, and more than anything I wanted to capture that feeling, that magic, in my fall table setting this year. 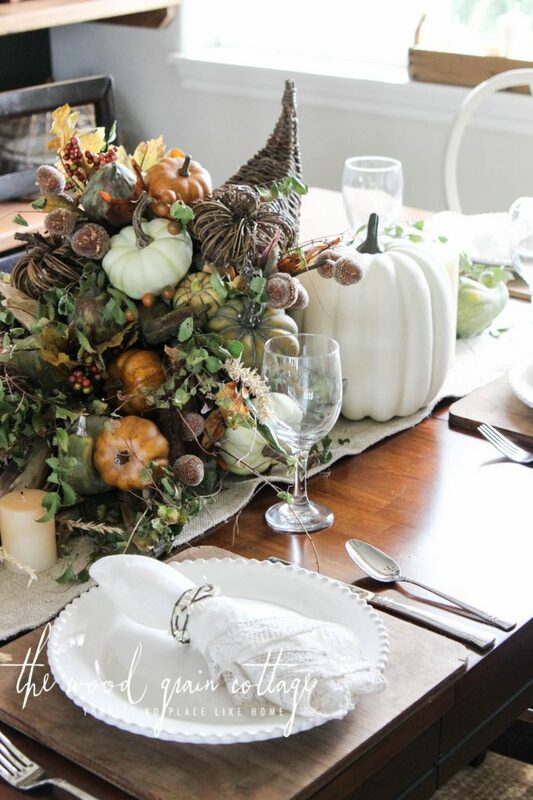 I am so happy and honored to be joining another amazing group of bloggers and to be sharing our fall table settings, all brought together by Alicia from A Burst of Beautiful. Once the centerpiece was done, this table came together in no time. I used regular staples from my serving and décor collection to create the rest of the table. Remember those wood chargers I made years ago? They made their way onto the table too! It transforms beautifully from every day use, to special occasion! Just another reason I love white dinnerware! Next week I’ll be sharing part two of our fall home tour (you can see part one right here), but here’s a peek at the dining room! So that’s my fall table setting! I’ll be sharing another tablescape idea once we get a little bit closer to Thanksgiving, and I’m excited to see how it comes together! In the mean time, be sure to stop by and visit my other friends doing the tour! The inspiration is amazing… as well as the beautiful pictures! Gorgeous!! Love, love it! Your bookcase looks great too! So pretty. I love the use of the cornicopia. your centerpiece is stoning and so simple but elegant. love your wood charges and i might just copy it!